Like the Pitts Special, a two seat version of the Acrosport followed, also designed by Paul Poberezny. It was slightly larger with with a wingspan of 21 feet 8 inches (6.58 metres) and a length of 18 feet 10 inches (5.72 metres). Its empty weight was 850 pounds (386 Kg) and MAUW was 1520 pounds (690 Kg). We have had 3 Acrosport 2's in New Zealand to date, and all 3 are still active (which is a much better record than our Acrosport 1's!). The photos are from the Keith Morris collection. 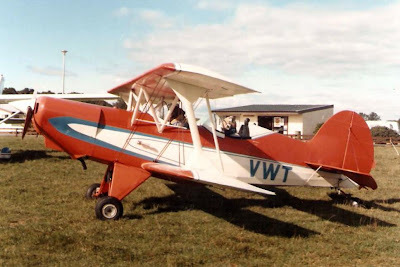 ZK-VWT (c/n AACA/635) was built by Dave Comrie of Dunedin and was first registered on 4/2/82. It was sold to R K McLellan of New Plymouth on 15/5/85. It is photo'd above at the 1986 AACA flyin at Matamata. 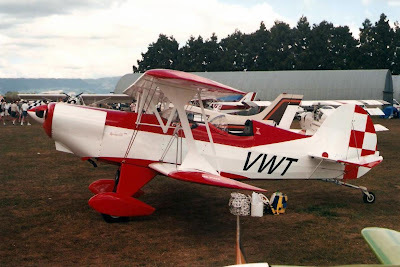 It then went to Vince and Alison D'Ath of Motueka on 15/4/97 and it was repainted in this colour scheme as photo'd at the 2000 AACA flyin at Matamata. It then went to Andrew Beazley of Hokitika on 27/4/07. He still owns it but he has moved to Canterbury and it is now hangared at Rangiora. Our second Acrosport 2 was ZK-DJK (c/n 1483) which was registered to Dariosh J Kraidy of Auckland on 17/2/00. This aircraft was started in South Africa by Dariosh and was shipped to New Zealand in May 1997. It has a Continental O-360 motor. 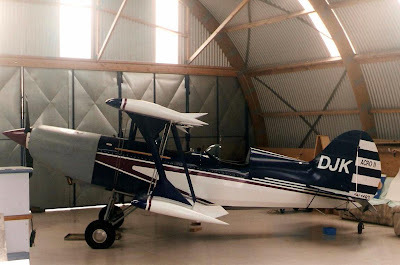 It is photo'd here in his hangar at Ardmore in 2000. Although it is still active I have not seen it fully completed. And our third Acrosport 2 (to date) is Neville and Les Worsley's ZK-CAW (c/n SP 1447) which was first registered on 8/2/08. This project was started by Bill Harris of Napier but was completed by Neville and Les at Rotorua, where is is currently based. It has a Continental O-320 motor with dual electronic ignition. The registration is from an agricultural DC 3 that Nev used to fly for Feildair. The above photo was taken at the 2009 SAANZ flyin at Ashburton. Air to air - away back when. ZK-HWB returns to the air today. Three microlights from the top of the South. The Motueka based North American T-6G Texan. FOR what it is worth ! Omaka on the first of March.